South Dakota is a small state, so to be effective our Congressional delegation needs to work together. Even though they battled for a seat in 2002, Senator Johnson and Senator Thune have put South Dakota first since Thune won the other Senate spot in 2004. 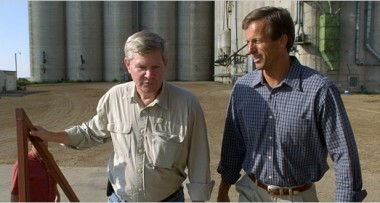 The above photo is from the New York Times (hat-tip to South Dakota Politics), when Johnson and Thune worked together to get South Dakota farmers drought relief. We have been lucky to have both men as Senators.